Technological breakthroughs constitute integral part of evolution in our age and assist in humanity’s acumen, development of services and product innovation. Indubitably, the focal point recently is Blockchain technology and its applications across industries. According to a PwC survey, blockchain finds its applications useful in a plethora of industries with the future seeming auspicious for the financial services, hence this perspective focusses on the fintech spectrum. Healthcare and hospitality industries are also alluring venture and corporate investments, without excluding private equity, private debt and hedge funds, who eye lucrative investment opportunities in these industries. 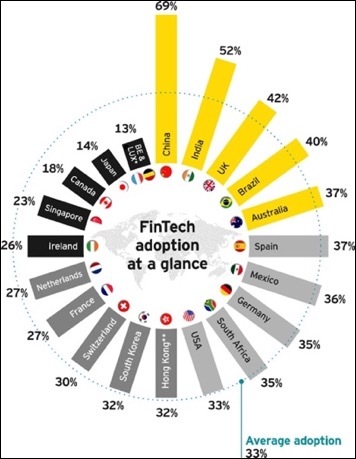 According to Ernst & Young’s Adoption Index, China, India and United Kingdom have the highest adoption rates and these numbers are expected to grow especially due to a revamp of payment solution and insurance services. Direct Lending via online platforms has a discernible effect on the market’s growth and constitutes a salient point for discussion amongst investors. 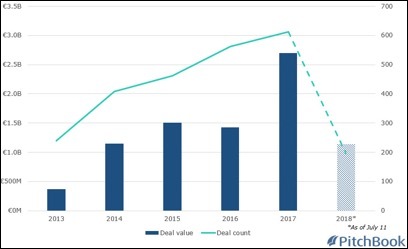 Figure 4 highlights the increase in capital invested from venture capitalists in fintech companies, despite a decrease in the number of deals over the last two years. The vast majority of capital was raised as seed or series A, B & C and less on private equity, debt and post-IPO equity. Europe, and the UK especially, is the home for many major players in the alternative lending space such as Zopa and Funding Circle and has seen the commitments in the region surging to record levels according to Pitchbook data. What is remarkable in Figure 5 is that fintech has raised until July 2018 similar amounts to those raised in prior to 2017 years. European venture capital has raised $4.2bn and half of those account for UK closed-ended funds, underlining the importance of Brexit for the landscape. The institutionalisation of the market and its development was showcased earlier this year with the European Investment Fund (EIF) and KfW investing in Funding Circle’s securitisation and the first listing of a fintech investment trust, Augmentum Fintech Plc, backing fintech lenders and crowdfunders as a VC partner, on the London Stock exchange. A report from by P2PFA, the UK Peer to Peer Finance Association, for 1Q18 reveals that cumulative lending via its platform members is approximating £9 billion in loan originations financing more than 50,000 businesses and over 200,000 individuals. It is easily comprehended that the online lending market is growing, and the market dynamics have altered mainly because the banks do not compete with platforms, but rather collaborate with them by providing facilities and warehousing lines of credit. Deloitte reported that investments into fintech lending are forecasted to increase to almost $11 billion in 2018, while the amount in 2017 and 2016 were $9.3 billion and $9.4 billion respectively. Another funding source for start-ups, which traditionally struggled to access finance for their projects, is equity crowdfunding facilitated by fintech platforms such as Crowdcube and Seedrs. Investors such as venture capitalists and other individuals without deep pockets are having access to multiple early stage products and ideas. These platforms perform initial due diligence on its listings which assists the less sophisticated investors with complicated business models. 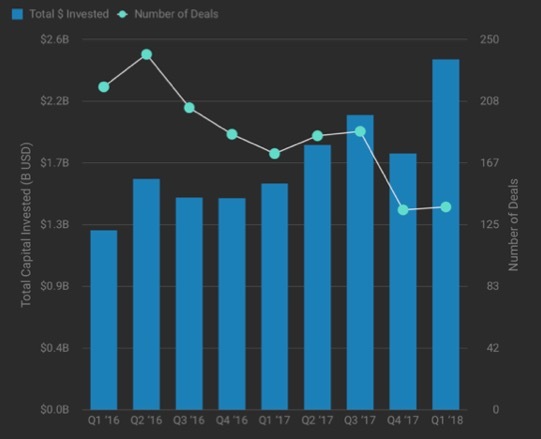 For later stage companies, private equity funding is really surging in the market, and combined with the limited set of opportunities, are driving valuations high. The adoption rates are still low as seen in Figure 3, hence attracting private equity firms that eye massive opportunities in this space. On the other hand, hedge funds would rarely invest in early stage companies, so they gain exposure via sectors that are susceptible to disruption and innovation such as TMT, energy and healthcare. Investing in disruptive tech could be challenging due to the abundance of products and services that are gratis offered and not generating sturdy returns. This make the manager selection essential searching for managers that can identify successfully solid technologies and themes that will change the world. 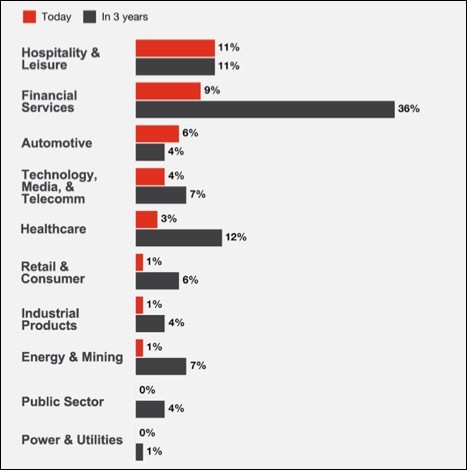 Themes that dominate the hedge fund world are urbanisation, artificial intelligence, environmental sustainability, robotics, 3D printing, next generation self-driving cars, cloud computing, crypto and cash digitalisation. Equity hedge strategies that pursue those themes have performed extremely well over the last years and have been one of the top-performing strategies among the hedge fund universe. 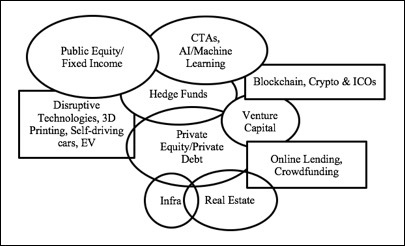 Moreover, hedge funds themselves are becoming a hub for scientists and are metamorphosing themselves into tech companies by developing their own sophisticated systems for trading and operations. The use of machine learning, algorithms and big data are the core techniques applied by CTAs and systematic funds to design their strategies and manage their portfolios. Investors have not lost their interest in CTAs despite the underperformance of last years and they are still seeking to eliminate human biases and relying on behavioural predictive analysis and big data for investments. 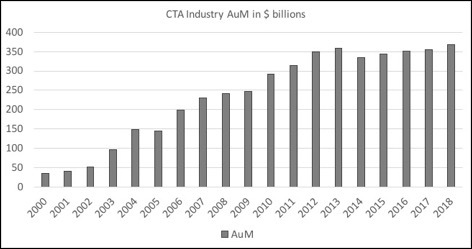 CTA’s assets under management peaked at the end of 1Q18, bolstering the previous years’ trend of allocating to systematic strategies. A number of CTAs have an eye on volatile assets, consequently investing in tech and crypto. The underlying volatility of Bitcoin combined with the institutionalisation of the market with the introduction of futures contracts and other index-related products such as ETNs, have captured the interest of CTAs and has led to the launch of crypto specific funds. According to Autonomous Next, the number of active crypto funds has surpassed 300 competing in a market of $256bn capitalisation and 1754 cryptocurrencies. Bitcoin and Ethereum account for 63% of the market cap, but both of them are struggling after last year’s rally. Crypto is not equal to trading cryptocurrencies but constitutes a vehicle for funding project in the “digital world”. ICOs have become the alternative to venture capital and traditional stock markets for many start-ups that build their business on blockchain. The most common platform for an ICO fundraise is Ethereum, whose smart contract functionality makes the platform appealing. The issue with ICOs is its legitimacy, with People's Bank of China and the South Korean government declaring ICOs illegal. On the other hand, the SEC Chairman states that most ICOs classify as securities, South Koreans are revising the ban enacted in 2017 and Germany's second-largest stock exchange is developing an ICO platform. 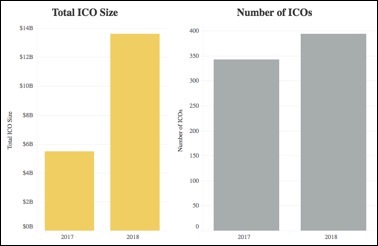 Total ICO size has more than doubled compared to 2017 and the number of ICOs has also increased compared to last year according to data from Coindesk, highlighting the growth of the market. In Stone Mountain Capital, we believe that comprehensive alternative investment advisory should reach across asset classes and interface between illiquid investments like real assets, infrastructure, venture capital, private equity, private debt, real estate and more liquid investments like absolute return strategies, hedge funds and fund of funds. Our main target is to achieve an optimal asset allocation for our clients in terms of performance, risk and liquidity under consideration of investment structure, size, and track record. Cross asset advisory implies an in-depth analysis of asset specific risk factors. Therefore, we provide the most sophisticated credit, market, operational, liquidity and integrated risk advisory. Stone Mountain Capital is an advisory boutique established in 2012 and headquartered in London. We are advising 30+ best in class single hedge fund and fund of fund managers across equity, credit, and tactical trading (global macro and CTAs). In private equity and private debt, we advise 10+ general partners across the sectors real estate, infrastructure / real assets and capital relief trades (CRT) by structuring funding vehicles, rating advisory and private placements. As per 19th July 2018, Stone Mountain Capital has total alternative Assets under Advisory (AuA) of US$ 52.3 billion. US$ 48.2 billion is mandated in hedge fund AuM and US$ 4.2 billion in private assets (private equity / private debt / real estate) and corporate finance. Stone Mountain Capital has arranged new capital commitments of US$ 1.28 billion across hedge fund, private asset and corporate finance mandates.